this is what I was thinking.... there was another thread in this forum somewhere... about container gardening?? I will have to try to find it. I want to do a large garden this year, but we moved to a new house, which DH built a 'garage' out back that kind of blocks the garden area that I was planning on doing my planting in. I'll have to wait before I plant anything to see if there will be shade created, and go from there. Hoping for some suggestions as to what type of veggies might want less light/more shade? And also where I might be able to find the 'containers' or big pots that I could put large plants/veggies in? Preferably free or cheap.... and creative ideas are best! Last edited by secheltsaver; Tue, Dec 10th, 2013 at 06:45 PM. They are really specialized in Rare seeds and offers great services and rates. For those of you who have purchased from Heritage Harvest Seed, they are going to be holding a draw for $50 gift certificates from among those who submit reviews on their Facebook page. Last edited by TrueNorthTreasures; Tue, Dec 24th, 2013 at 03:28 PM. Here is Harrowsmith's annual list of "The Best Canadian Seed Companies". There were several neat ones listed I hadn't heard of before. Last edited by TrueNorthTreasures; Wed, Dec 24th, 2014 at 12:14 PM. ROMEO and itsmewhoelse like this. How about an orchid seed? Where can i get orchid seeds? Orchid seeds are not considered satisfactory for self germination. Maybe you can get a plant? Re: seeds-was in Cdn Tire recently to admire the two brands of seeds on display and a friend bought a few herb seed packets for me. Will look for OSC Seeds in another store for lettuce and other easy vegetables to grow in containers in a sunny spot. Last edited by Ciel; Thu, Jan 16th, 2014 at 11:11 PM. Join me, and other women like YOU! BELIEVE & TRANSFORM is a community of positive, uplifting women who support and encourage each other with ZERO judgement! I order everything online from Alberta Nurseries in Bowden, Alberta. At first I simply wanted to buy local and have them produced in a safe way; this nursery develops seeds with the University of Saskatchewan...and I have to say most of everything has been fantastic. They all seem to have a much better germination rate than plain old seeds from the store. I also order potato seeds and rhubarb plants from them (they simply let you know when they will ship). This is a very old company based from the early 1900s and they have pleased me for the past 4 years. I buy most of my seeds from Baker Creek in the US and William Dam here in Canada. There are also quite a few smaller seed places I will order from such as Prairie Garden Seeds and Hawthorn farms. I order my aquilegia from Touchwood Plants in Wales. I have a lot now though so I don't need to order from her as much. Baker Creek Heirloom Seeds is having a 2 day promo - 20% off seed orders - simply enter the code fall2014 at the checkout. I tried to find it posted on their Facebook page but didn't see it. I found out through their e-newsletter today! Saw this posted on the Baker Creek Seeds Facebook page. I think I have this affliction! LOL! Newfiescreech, ROMEO, Ciel and 1 others like this. The days are getting longer after the winter solstice. Sun is still playing hide and seek, however! 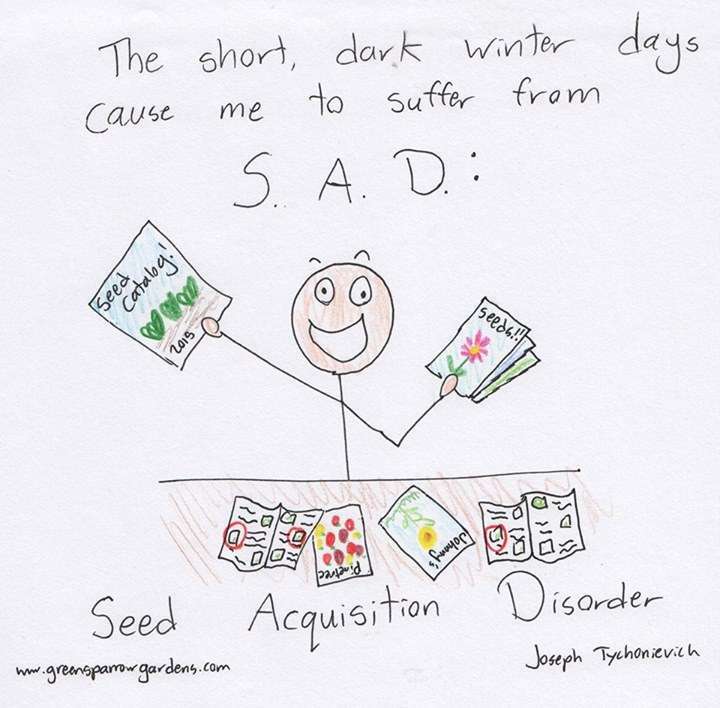 Bring on the seed catalogues. ROMEO, GoJays and TrueNorthTreasures like this. ROMEO and TrueNorthTreasures like this. I have received the OSC and the Heritage Harvest Seed catalogs and am looking forward to going through them. This year, I treated myself to the massive and beautiful Baker Creek Seeds catalog . To my surprise, it was displayed in the magazine rack at Shoppers Drug Mart! I also enjoy the catalog from The Cottage Gardener in Ontario, but I'm not sure I'll receive one this year, as I didn't place an order with them last year. For those of you in Canada who grow heirloom vegetables, herbs, and flowers: Salt Spring Seeds has recently updated their website and in their latest newsletter, put out a call for high quality pictures of the items they sell. For every picture sent in that is used on the website, the owner, Dan, will send the photographer two packets of seeds of their choice! The pictures submitted have to be original/belong to the person submitting them. For more details, check out the latest Salt Spring Seeds newsletter, or me pm your email address and I will forward it to you. Last edited by TrueNorthTreasures; Sun, Jan 11th, 2015 at 07:49 PM.